Every weekday at noon on the dot, there would be a mass exodus from office buildings across the city, as coworkers headed out to grab a meal. Lucky for me, I worked in an area of the city where restaurants were abundant and extremely varied. 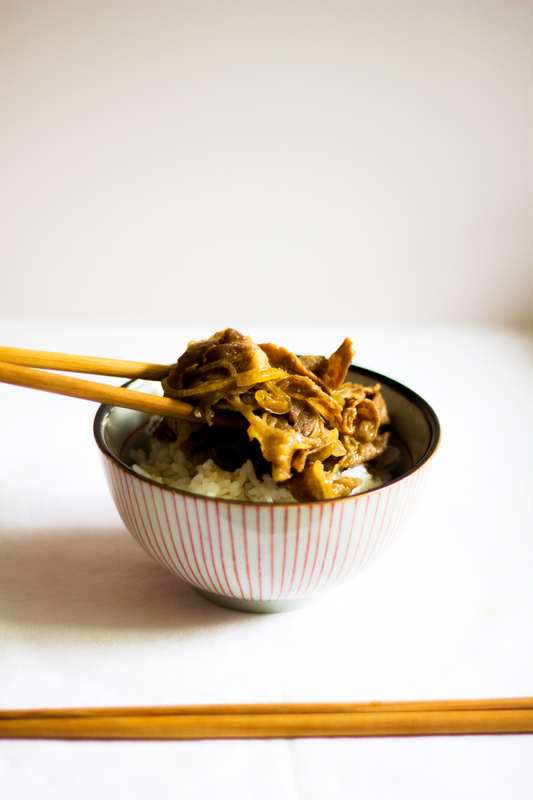 Gyudon is basically a dish of thinly sliced fatty beef, cooked in a slightly sweet mixture of mirin and soy sauce and served over rice. Sake is also sometimes added for extra flavor. It’s truly as simple to make as it looks and yet it makes for a satisfying meal. 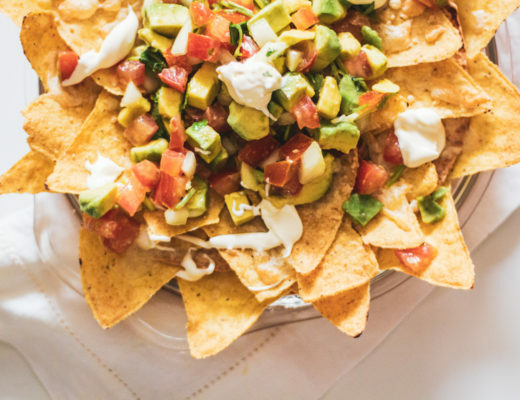 Since it’s an simple dish, every ingredient in this recipes plays a very big part for this dish. Let us start with the Thinly Sliced Beef. 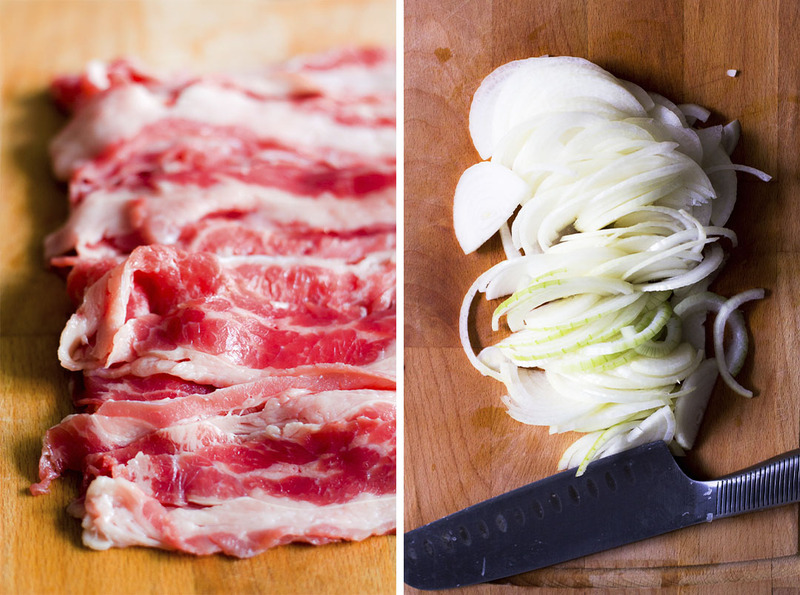 If you don’t eat beef, you can make this dish with thinly sliced pork as well. Just make sure the meat is thinly sliced. We headed down to the Japanese grocery stores carry thinly sliced meat (both pork and beef) for the meat. But if you can’t find it in the refrigerated or frozen meat sections, you can purchase a block of meat and slice them on your own. The next second main ingredient is onion. If you really do not like onion, you can skip; otherwise, please include it. Cooked onions are tender and give sweetness to the sauce. Therefore, I consider the onion just as important as meat in this recipe. 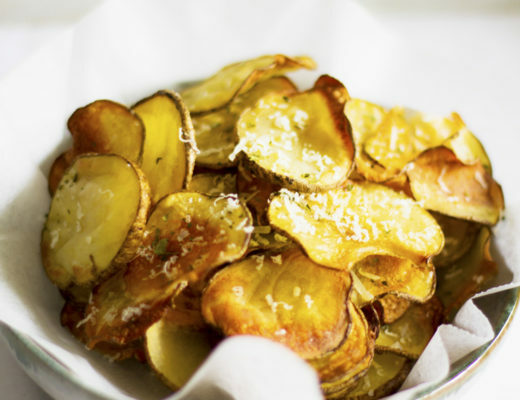 You can use regular yellow onion, sweet onion, or even purple onion (if the color doesn’t bother you). 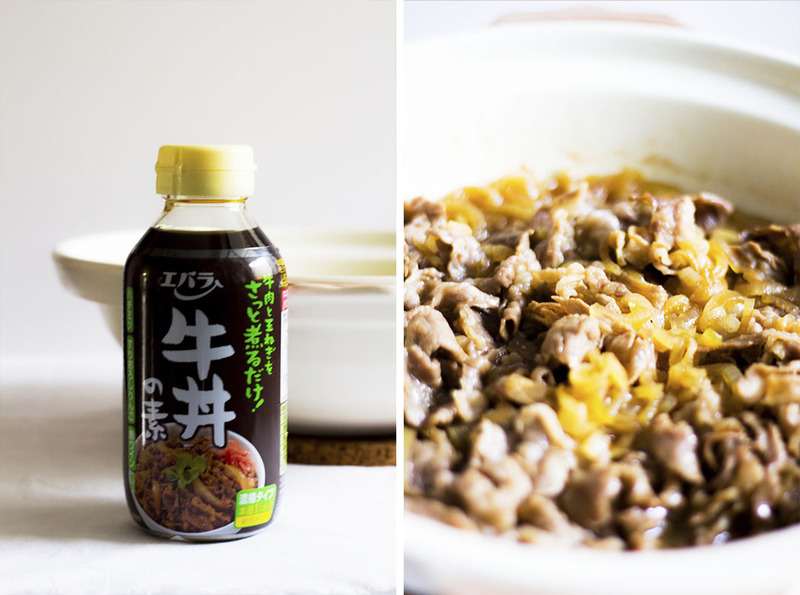 We usually go for homemade sauce, however we decided to give pre-made Gyu-Don sauce a try as our friends always recommend us this brand. Gyu-Don is honestly the Best. Thing. Ever. 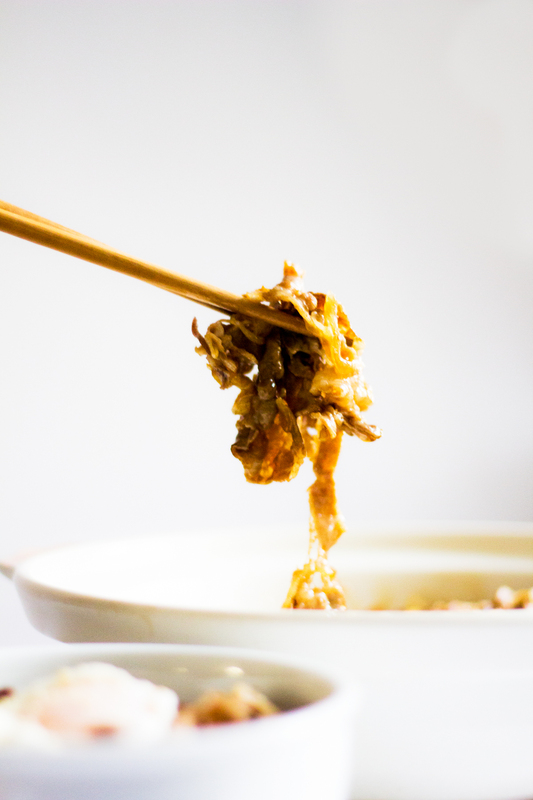 It would warm up as you mixed it in with the hot beef and rice, imparting a richness to the dish that couldn’t be beat––not even by the beckoning call of hand-pulled noodles or Mala hot pot. Needless to say, I frequented that particular spot at least once every couple weeks. 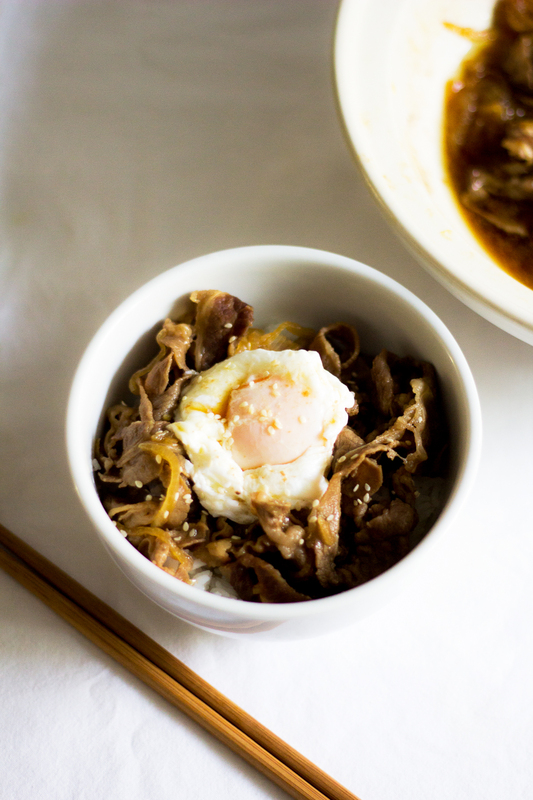 I’ve been seeking to recreate some of our old favorites, and this Gyu-don recipe is definitely one of them! 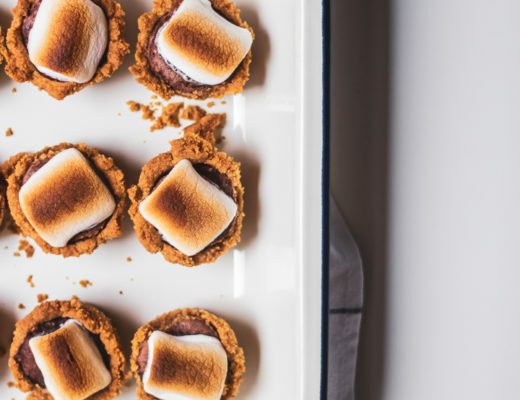 It’s truly as simple to make as it looks and yet it makes for a satisfying meal. Add the beef and sugar, and cook until the beef is slightly browned. Add the gyu-don sauce. 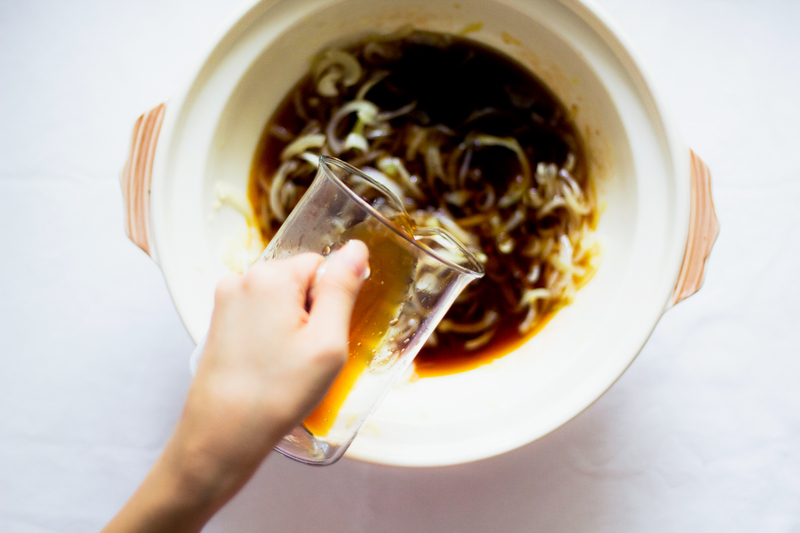 Bring to a simmer, and cook for about 10-15 minutes to reduce the stock into a thin sauce. Taste for seasoning, and add a little more soy sauce if needed. 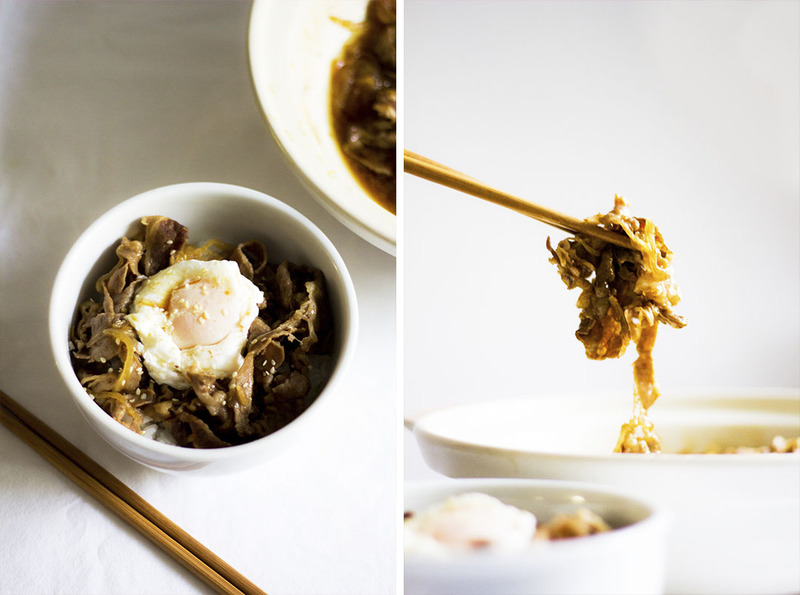 I hope you enjoy making this Gyudon recipe! If you try it, don’t forget to share your picture on Instagram, Facebook, or Twitter with #byplaincanvas. Thank you so much for reading, and till next time!